Menaskai(Curry) is a real treat to your taste buds. For those who love the combination of sour, sweet & spice.., this is the perfect dish. Everytime I eat this , i feel rejuvenated. This is again a Udupi cuisine. During the weddings, naming ceremony or any festivities, this dish is again one of the must in the innumerable items prepared & served. 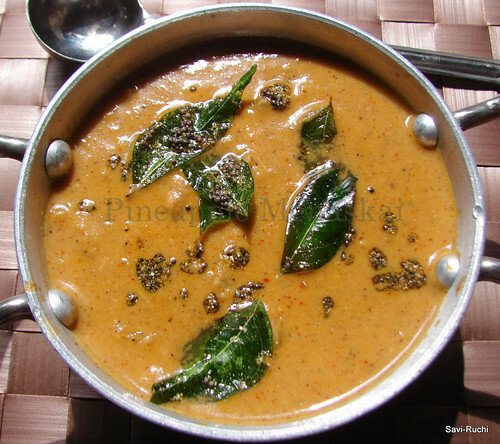 There is pineapple gojju(gravy/curry) also prepared during Karnataka weddings (Mysore/Bangalore side). I do not know if both menaskai & gojju use the same ingredients. Will check with my grandmom during my next visit to India & update here. Soak the tamarind in warm water(about 1/4th cup water) for 10mins. Extract the thick juice from the tamarind & discard the pulp. Boil the pineapple in 1/2 cup of water. When pineapple is half cooked, add tamarind extract, jaggery, salt to the pineapple & cook again until soft. Meantime, dry roast the sesame seeds & red chilli seperately. Allow them to cool. 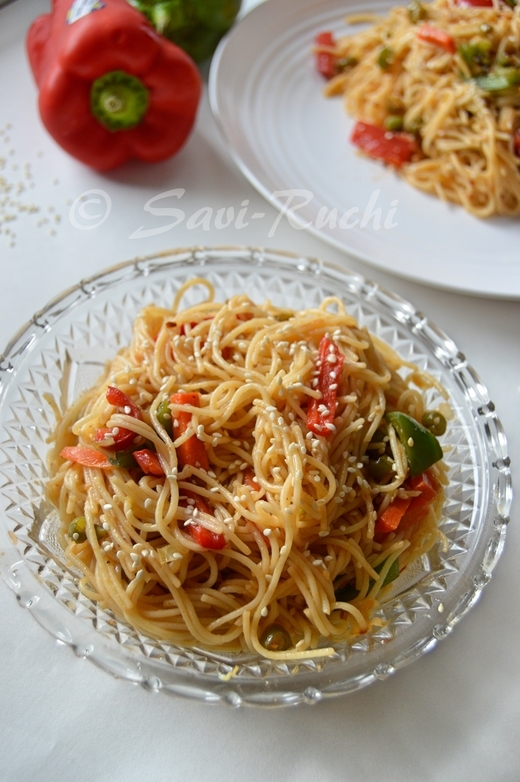 Make a fine paste of coconut, sesame seeds & red chilli. Pour the paste to the pineapple mixture, 1/4th cup water & cook it on a low heat for another 5-7mins. Prepare the tempering. Add oil to a small pan, when oil is hot, add mustard seeds. 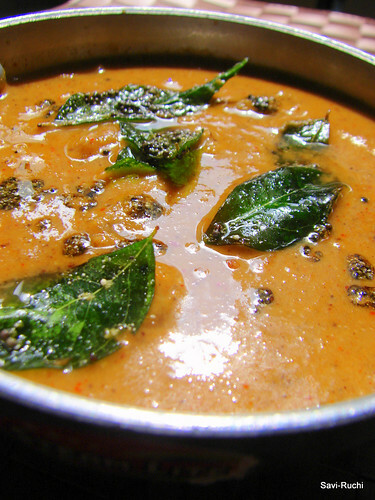 When mustard seeds splutter, add curry leaves, red chilli & saute for 5-8secs. Finally add the asafoetida & turn off the heat. Pour this tempering to the prepared pineapple menaskayi/curry. Serve it hot/warm as a side dish to rice. The dish is usually made using fresh coconut. I replace it with dry coconut because that way I can preserve it for 3-5days in my refrigirator. 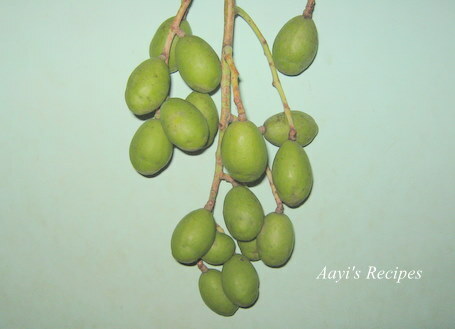 If you are sure to use this in a day or two, feel free to add fresh coconut. Pineapple could be replaced with mango, bittergourd, ambade/amtekayi(Thanks to Shilpa of Aayisrecipe for this picture) or capsicum. This dish tastes better the next day. Donot forget to boil this once a day, cool it & then store it in the refrigirator. I make this too. Only difference is I also add jeera and methi along with ellu. Looks so good I want to go make it. Thats a tempting dish, very new for me.. Very new to me and the first picture is so gorgeous! Super curry. Nice click too. Goes very well with rice. Love the colour too. good one..thanks for sharing a nice recipe.. Bookmarked!! Love the spices and flavors in this curry! Can it be made with any other veggie or than pineapples? Yummy. It was soooooooo gooooood.